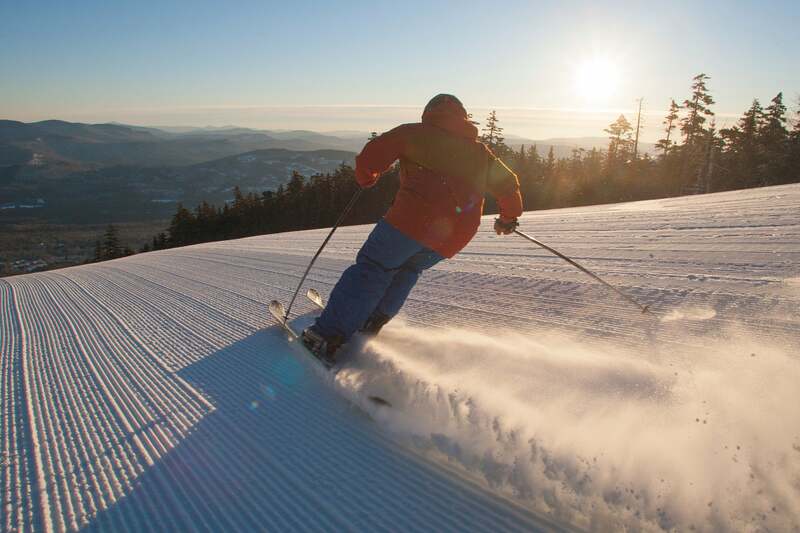 Any day skiing at Sunday River in Bethel, Maine, is a good day. But follow this guide to make it great. Preparation precedes perfection. Plan your trip in advance to get what you want on the dates you want. You’ll save money on lodging and lift tickets, which can be purchased before you leave, so that you’ll have more to spend on little perks (hot chocolate, chili, an apres-ski beer or two) that help turn a good getaway into a memorable one. 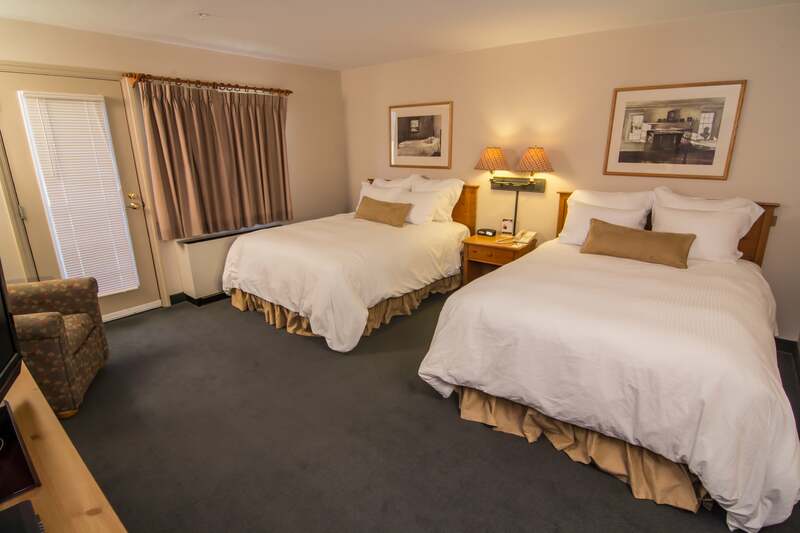 Book a room in the slope-side Grand Summit Hotel. Of course, the perfect ski day starts with easy access to the slopes, not lugging all of the equipment to and from a car or a shuttle bus and then up to the lodge. 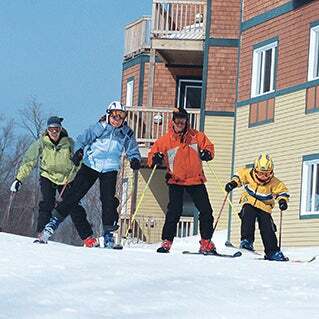 Sunday River has two slope-side hotels, the Grand Summit and Jordan Hotel, and a third that’s within walking distance to the slopes: Snow Cap Inn. There is something about the ski-in-ski-out experience that just makes a ski weekend feel special, like a splurge. And even though Snow Cap Inn isn’t technically slope-side, it’s centrally located within Sunday River and just as affordable as off-resort options with a big bonus: You can bring your snow-loving dog to play thanks to certain pet-friendly rooms. But if you want to ski out your door (and you know you do! ), the Grand Summit Hotel has all the comfort and convenience that make it the perfect choice for families who want to be where the action is. Likewise, the Jordan Hotel has close access to the most snow on the resort. On the drive up, keep your eyes peeled for Eddy the Yeti. When it’s go time, go the fun way: On Sunday River’s Chondola, a hybrid chair-gondola lift that makes the ride up comfortable and glorious. Take it from the base at South Ridge all the way to the top of North Peak. To access the full range of slopes,Sunday River has 15 chairlifts that traverse eight interconnected mountain peaks. Jordan Bowl, the area’s westernmost peak, has stunning views of Mount Washington in addition to highway-like trails, including Rogue Angel and Excalibur (both of which are blue and super-wide for great carving). And by being farther out from the center of the resort, both offer solitude. Take a ride in a Chondola to see stunning views without the harsh winds. After avoiding the crowds on the slopes, stop for a lunch break at the ski-in/ski-out Sliders Restaurant or, Thursdays through Sunday, at the Mountain Room. Sliders is located inside the Jordan Hotel, where you can take in views of the terrain you just tackled while enjoying pub fare, like Maine poutine and the classic Slider’s burger, and one of the six rotating Maine craft beers on tap. The Mountain Room is renowned Portland chef Harding Lee Smith’s outpost at Peak Lodge, featuring small plates and ridiculously delicious paninis—not to mention easy access from the Chondola. 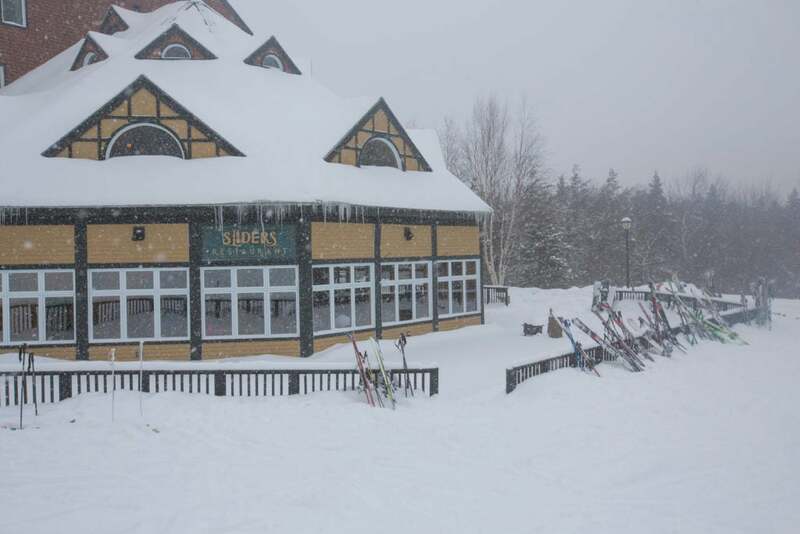 Stop by Slider’s for a burger and beer break mid-ski. Up and at ’em! It’s time to burn off lunch. With 135 trails and glades to choose from, you’ll definitely want to keep skiing. 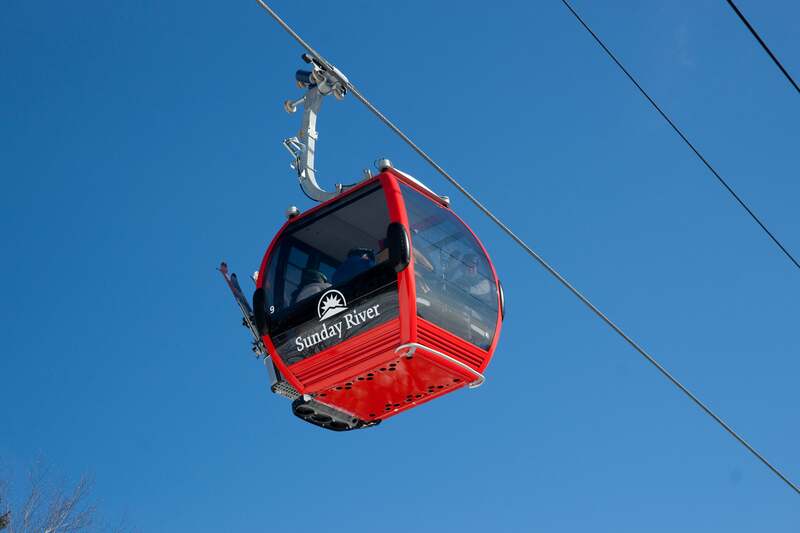 Whenever you feel like you’re done for the day, hop on the resort shuttle to return to your lodging or another Sunday River stop. The shuttle’s hub is the South Ridge Lodge, home of the resort’s most popular après ski spot, the Foggy Goggle. Watch your fellow skiers in action while you warm up with a burger, soup, or nachos and quench your thirst from the ever-changing list of Maine brews on tap and from the cooler. If you’re staying slope-side, you can also warm up in the outdoor hot tubs or the outdoor pools at the Grand Summit and Jordan hotels. If you’re still in explorer mode, take the Mountain Resort shuttle into the nearby town of Bethel to check out its shops, boutiques, galleries, restaurants, and bars. For dinner, find your way to—or back to, if you’re lucky enough to be staying there—the Grand Summit Hotel for dinner at Camp. Think comfort food with a modern touch and local, seasonal ingredients, such as baked scallops with a spinach/wild mushroom bread pudding or roasted stuffed winter squash. Blue trails like Excalibur or Rogue Angel are super wide and ideal for great carving. Why stop now? Have we mentioned there’s night skiing? Slopes stay open until 8 p.m. on Fridays, Saturdays, and holidays, including President’s Day week until late March. Once you’re done, the Foggy Goggle will happily help you refuel. Depending on how your ski went, you may or may not feel you’re due the Goggle’s specialty cocktail, called Faceplant. 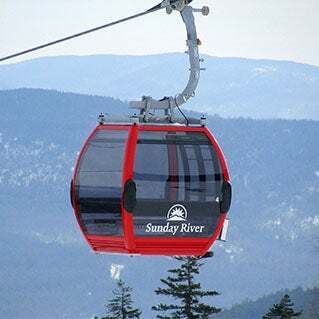 Sunday River has special events throughout the season. 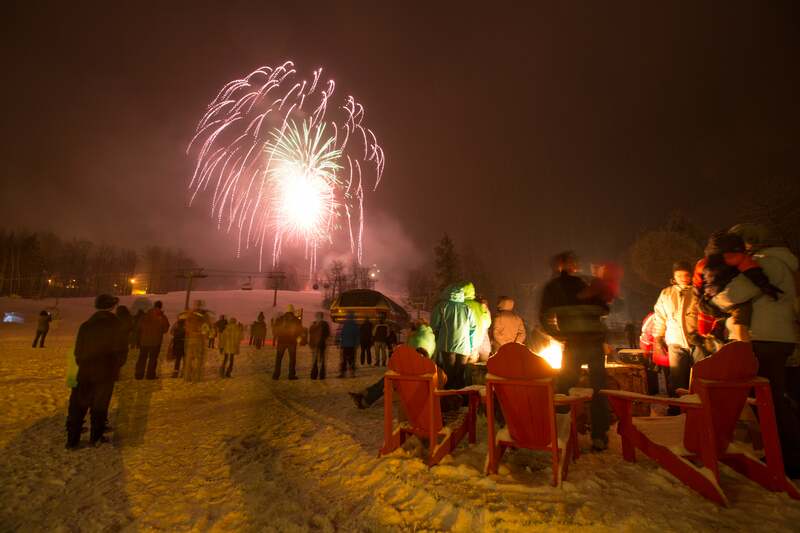 Firework shows happen almost weekly, starting at 8:30 p.m. Watch from inside the South Ridge Lodge or Foggy Goggle, or outside while gathered around a bonfire. Another great family option: Black Diamond Entertainment, held most weeks at the Grand Summit Hotel, with offerings ranging from magicians and jugglers to music and fire dancers. End your day by sharing highlights with friends and families on Instagram. If you use the hashtag #happyplacefound, you might find your photo on the Sunday River website when you wake up sore but energized to do it all over again. Evening fireworks cap a memorable perfect day on the Sunday River slopes.